John Lundberg is an artist and filmmaker. He graduated from the National Film & Television School in 2004, where he made four documentaries. His film The Mythologist was broadcast on BBC4 in 2004. It won the Jerwood First Cuts Documentary Award at the Sheffield International Documentary Festival and was shortlisted for the Grierson Awards in the best newcomer category. Underpinning all of his work is a deep interest in how myth and artifice can shape and alter reality. 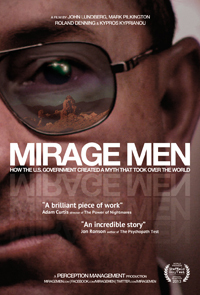 His debut feature length documentary Mirage Men about how the US government created a myth that took over the world had its world premiere at the 20th Sheffield Doc/Fest in June 2013. The film was created by John Lundberg with Mark Pilkington, Roland Denning & Kypros Kyprianou. The Mirage Men book which documents the making of the film was written by Mark Pilkington and published in 2010 by Constable. He is currently developing his next feature length documentary Kaufman Lives about the life, death and legend of Andy Kaufman. John founded the arts collective Circlemakers in the early 1990s and has been creating crop circles all over the world ever since. There are chapters about his crop circle making exploits in both Henry Hemming's book In Search of the English Eccentric and Iain Aitch's book A Fete Worse Than Death. With Rob Irving he is the author of The Field Guide: The Art, History and Philosophy of Crop Circle Making. Crop circle clients have included: Korn, Shredded Wheat, Microsoft, Greenpeace, Big Brother, Nike, UKTV, The Sun, Hello Kitty, Sky One, Mitsubishi, AMD, Thompson Holidays, 02, Richard & Judy, Orange Mobile, and BBC. Occasionally he writes articles, covering crop circles, mind control, the Roswell alien autopsy and snuff movies for the Daily Mail, Fortean Times, Strange Attractor and UFO magazine. With Mark Pilkington he co-founded Strange Attractor, which started off as a series of events and has now been developed into a highly praised journal and press. Before pursuing his passion for film making John ran his own successful digital design company producing award winning interactive content for companies such as MTV, BBC, Cartoon Network, Sony Music, and Discovery.